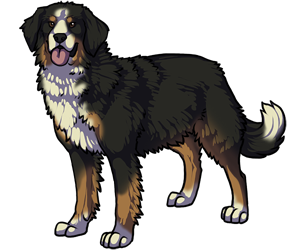 The Bernese Mountain Dog was bred to be an all purpose farm dog. Their jobs included companionship, drafting, herding, and guarding. The breed originated in the Swiss Mountains of Switzerland and were developed before the 1800s. Today, the breed excels in many dog activities including guarding, herding, tracking, companionship, obedience, and drafting. The Bernese Mountain Dog was named after the Canton of Bern. Due to the uprise of cancer in the breed, the Bernese Mountain Dog's life span has decreased from 10 - 12 years to 6 - 8 years. The breed is one of four that originated in the Swiss Alps.